See the vehicles of Star Wars: The Force Awakens™ in unparalleled detail with this newest addition to the Star Wars Incredible Cross Sections series. Twelve breathtaking artworks bring the new craft to life, showing all of the weapons, engines, and technology, while engaging text explains each vehicle’s back story and key features. The art really is lovely too. After all, Star Wars is largely a visual medium, and The Force Awakens Incredible Cross-Sections enhances these new (or reimagined, in the case of the Millennium Falcon) additions to the mythology. Normally, adding verisimilitude to Star Wars is not what I particularly look for, but there is real story here. The description of the Falcon even contains a gem about a wedding gift for Leia Organa, thus answering the question of Han Solo and General Organa’s relationship. Jason Fry has a gift for making the ordinary sound extraordinary, and it is certainly on display here. Another highlight of the book are the descriptions of vehicle technology at the beginning of the work, as well as the scale of all the vehicles at the end. Some key terms of particular components of Star Wars vehicles are illustrated (hyperdrives, shields, etc. ), as well as explained, and bring a nuance of realism that is refreshing, as opposed to appearing too esoteric. The scale is particularly interesting, as it literally puts things in perspective. Personally, it would be intriguing to see how Darth Vader’s Star Destroyer compares to the Finalizer, but perhaps that will be revealed in a future work. Nevertheless, a reader cannot help but feel more proficient in Star Wars lore after exploring these pages. Fry is an author who gets Star Wars in a poignant way, and breathes life into what could easily be a casual read. His description, as well as the lovely images, will have you returning to the book more and more than you might originally suspect. 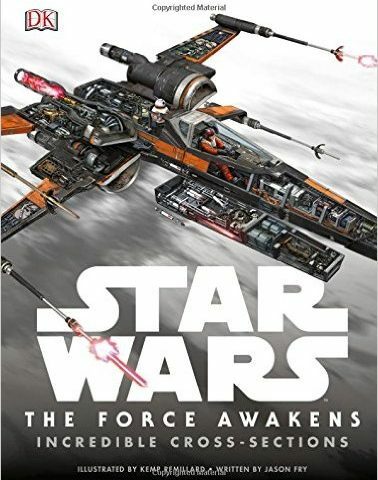 Star Wars: The Force Awakens Incredible Cross-Sections is fascinating, and is certainly a worthy resource, as well as a source of joy for fans of the hit film. Del Rey has released another essential piece of Star Wars that feels less like a resource, and more like an opportunity to experience The Force Awakens from the pages of a work of informative art. Note: A big thank you to DK Publishing for providing an advanced copy to review. Next article Did C-3PO's Memory Really Need to Be Erased?